Indian classical music is known as shastriya Sangeet: literally, music based on the shastras or scriptures. While a shastra is always a written text, the material for many such treatises goes back beyond the era of the written word, handed down through a strong oral tradition that is the basis of teaching and learning in Indian music to this day. The two pillars of Indian classical music are raga-the melodic unit-and tala, the rhythmic unit. Traditionally, Indian music is a solo form. Typical western music features like orchestration, harmony, and chords are absent. When we look at the rhythmic unit then the first Indian instrument that comes to our mind is Tabla. It is an instrument which is commonly used as an accompanying instrument in the Indian classical music. It grew with the development of ‘Khayal’ in vocal music and ‘Kathak’ in dance, gradually overshadowing it’s precursor the traditional pakhawaj, which is pertinent to the esoteric Dhrupad system. Best of… series showcases some of the finest recordings of various instruments from Saregama archives. Table means “drum” in Arabic. This percussion instrument, a native of India, has slowly won popularity all over the globe. The table consists of a pair of hand drums of differing size and timbre. Its transformation from a religious folk instrument to a classical one happened sometime in the late 18th or early 19th century. The ‘right-hand’ drum, called the dayan, is a conical drum-shell carved out of a solid piece of hard wood. The “left-hand’ drum, called the bayan, is a hemispherical bowl-shaped drum made of polished copper, brass, bronze or clay. There are two main types of gharana associated with the table: the Dilli Baj that developed in Delhi and the Purbi Baj, that developed in East. These are then further divided into the Delhi gharana, Lucknow gharana, Ajrara gharana, Farukhabad gharana, Benares gharana and Punjab gharana. Each gharana has its signature style and can be distinguished by the compositional and playing style, table positioning and bol techniques. In earlier times, these divisions were strictly maintained and were regarded as court or family secrets to be passed on to one’s successor, but now the divisions are blurred and the newer generation has learnt to combine different aspects of various gharanas in their music. The most notable players of this instrument include Ustad Zakir Hussain, Ustad Alla Rakha, Ustad Jnan Prakash Ghosh, Shankar Ghosh and Bikram Ghosh. Ustad Alla Rakha was born Allahrakha Khan on 29 April, 1919 at Phagwal village near Jammu, about 80 kms from Lahore. His fascination with the sound and rhythm of the table started at the age of 12, while he was staying with his uncle in Gurdaspur. The young Alla Rakha ran away from home to become a disciple of Mian Kader Baksh of the Punjab gharana. He also studied vocals and the intricacies of raga vidya under Ustad Ashiq Ali Khan of the Patiala gharana of music. His musical career began as an accompanist in Lahore. Then, in Bombay in the year 1940, he gave his first solo table performance as an All India Radio staff member. Soon after, during the period 1943-1948, he composed music for a few Hindi films. Meanwhile, he continued as an accompanist for maestros like Ustad Bade Ghulam Ali Khan, Ustad Allauddin Khan and Pandit Ravi Shankar. It was his association with Ravi Shankar that won him world wide fame. As his chief accompanist in the 1960s, he delighted audiences in the west. They were invited to play at the Monterey Pop Festival. He was not only a brilliant accompanist with flawless timing and sensitivity but also, as a soloist, he was a master of improvisation, a profilic composer and an electric showman. His partnership with Ravi Shankar served to introduce Indian Classical music to western audiences. He popularized the art of playing the table, elevating the status and value of his instrument. He also played a role in bridging the gap between Carnatic and Hindustani classical music. Ustad Alla Rakha became guru to Yogesh Samsi and to his sons Taufiq Qureshi and Fazal Qureshi. But his most famous disciple turned out to be his eldest son, Ustad Zakir Hussain. Ustad Alla Rakha died of a heart attack on 3rd February, 2000. Ustad Zakir Hussain was born in the year 1951 to the table legend Ustad Alla Rakha. He is a brilliant table player of international repute. His expressive and soul-stirring playing has raised the table from a mere accompaniment to the status of a Ustad Zakir Hussain was born in the year 1951 to the table legend Ustad Alla Rakha. He is a brilliant table player of international repute. His expressive and soul-stirring playing has raised the table from a mere accompaniment to the status of a magical solo instrument. In spite of being a virtuoso on the table, his compositional abilities have never been confined to a single instrument. His command over the language of rhythm, his capacity to reduce the rhythmic fabric to its elementary threads has made him the most prolific artist in the field of fusion music. The uniqueness of Zakir Hussain lies in the fact that the table is veritably an extension of his being-an effervesant, sensual, flighty and eloquent being at that. 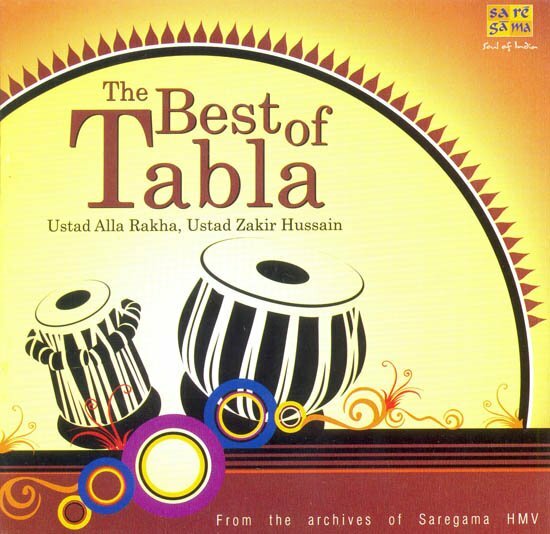 Zakir Hussain’s table speaks, cajoles, seduces and ultimately mesmerizes. Combined with his stunning stage presence and charisma, Zakir Hussain’s artistry has made him one of India’s most powerful comtemporary cultural ambassadors. As the son of Ustad Alla Rakha, he went through a thorough and rigorous training. Precocious from his childhood, Zakir was going on world tours by the age of 12. In this sense, it can be said that there has been no juvenile music from Zakir Hussain. In 1987, his first solo album ‘Making Music’ was critically acclaimed as one of the most successful East-West fusion albums ever recorded. In 1975, Zakir, along with guitar maestro John McLaughlin formed a band called ‘Shakti’. Although disbanded later, in 1992 the band was reunited again under the name ‘Remember Shakti’ and it set off for a world tour. In the year 1992 Zakir collaborated with Mickey Hart, for an album Planet Drum, which won a Grammy under the category of Best World Music Album. However, the crown of Zakir’s career perhaps lies in his magical performances artist, playing with artists as diverse as George Harrison, Ali Akbar Khan, Vasant Rai, Imrat Khan, Ravi Shankar, Joe Henderson, Van Morrison, Jack Bruce, Tito Puente, Pharoah Sanders, Billy Cobham, the Hong Kong Symphony and the New Orleans Symphony.